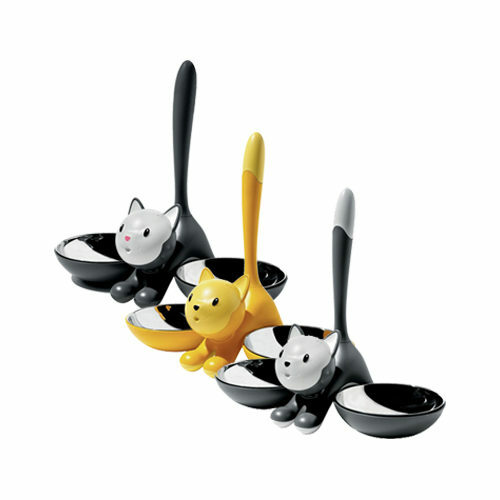 Alessi Tigrito Feeding Bowl is a fun designer food bowl for your cat. This feeding bowl consists of two fun dishes with a cat statue in the middle. The dishes are made from stainless steel and the statue is made from a durable plastic material. Alessi Tigrito Feeding Bowl for Cats is a beautiful designer feeding bowl for your cat. This feeding bowl consists of two stainless steel bowls with a durable plastic cat statue in between. These two bowls have a 550ml capacity. The two food bowls in the Tigrito are removable and dishwasher-safe. Black, yellow or light blue. Have you used Alessi Tigrito Feeding Bowl for Cats before? Let us know what you think about this product.